You can purchase Word 2016 as a stand-alone software program, or you can pay for a subscription to the Office 365 service. With Office 365, however, you get more: You get free updates to the latest version, up to five separate installations of Word (and the rest of the Office suite) on PCs, Macs, and mobile devices, and you get additional OneDrive storage. Office 365 is a subscription service. It provides you access to the Microsoft suite of programs for an annual fee. Not every Office 365 subscription offers the full Office suite, but they all include Microsoft Word. The term Office 365 is synonymous with the current release of Office. So the version of Word used with an Office 365 subscription is currently Word 2016. When a newer version of Word is released, Office 365 users update automatically. If you find that buying Word as an individual software package works for you, great! In a professional situation, or perhaps when you own a few gizmos and are tired of frequently buying each one a new copy of Word, then the Office 365 subscription is worthy. If you’re curious about Office 365, visit office.com. You can download a free trial, read about options for mobile devices and the web, and gauge whether it’s a worthy offer. The current annual price for a single Office 365 subscription is $70 for an individual. This license includes access to Word on the web as well as the installation of Office 365 on a PC and mobile device. Included with the basic ($70) Office 365 subscription is 1TB (terabyte) of OneDrive online storage. Your organization or school may offer you a complementary Office 365 subscription. This access includes a copy of Word that you can download, access to Word on the web, as well as specific online storage and other goodies. Choose Account from the items listed on the left side of the screen. 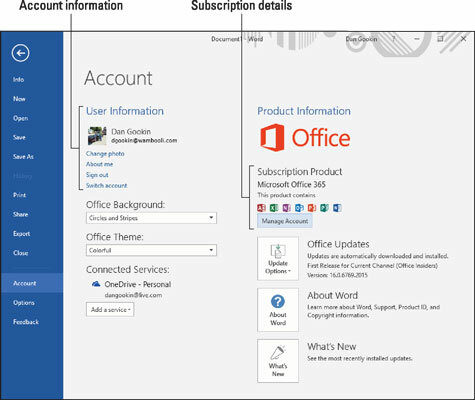 If you have an Office 365 subscription, you see details similar to what’s shown in the following figure. If you don’t see your user information on the left side of the window, click the Sign In button to sign in to Office 365. To check on your account’s status, confirm your renewal date, check credit card information, or perform other subscription tasks, click the Manage Account button on the Account screen. You’re taken to a web page where you can sign in to your Office account and review various settings. One of the items you can perform on the Office website is to install Office 365 on another computer, such as your laptop or perhaps another system in a home office. You can also manage those installations, for example, removing an installation from your old laptop so that you can add it to your new laptop. Checking your Office 365 subscription. If you start Word and it informs you that your Office 365 installation has become invalidated, follow the steps in this section and sign in again to reactivate the account.